The lush green ficus tree is among our most popular, and with good reason. With vibrant leaves and full branches, it adds classic beauty to any setting. The ficus comes in a 10 inch pot. A lovely orchid is the perfect choice to send for any occasion. So send it, and you'll really send that special someone. The container and color of the plant may vary. A lovely assortment of blooming african violets, comes fresh to you to nuture and enjoy. We have a large assortment of colors, so colors may be different than in the picture. Also known as a "European Dish Garden", this product contains green and blooming plants. This planter also includes fresh flowers which are not shown in the picture. A peace lily requires very care. It needs to be watered once to twice a week depending on climate. Peace lily is ideal for grand openings of new businesses or to be sent to a home for sympathy. What could be more precious than a real miniature rose bush? A delightful and long-lasting floral gift than can also be replanted in a garden. Colors of plant and container may be different than shown in picture. Can't decide which plant to send? 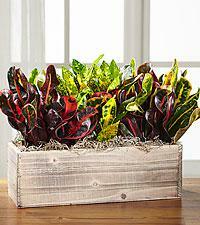 Let our staff design something special with their most beautiful blooming and green plants in a basket. The combination will be make a lovely presentation - appropriate for any occasion! This plant enjoys indirect light, making it perfect for most indoor settings. With its impressive height and many stalks, it's perfect for more places than just the living room. The plant comes in a 8 inch pot and stands appx 36in high. Symbolizing faithfulness and virtue, the velvety African violet conveys enduring admiration. Tucked into a charming wicker basket and paired with ivy, it’s a flowering garden. We have beautiful Azalea plants in stock and ready to send out to your special someone. Please keep in mind that Azalea can be re-planted. Woodland Greens can be sent for many occasions. It contains mixed our mixed "Florida Fresh" green plants in a clear glass bubble bowl for a modern look. Plants are all easy to care for, requiring water 1-2 times a week. This item includes both green and blooming plants. The blooming plants will be pink, the types of blooming plants used may vary. In the event that no pink flowers are in stock, we will substitute with another color.